Themes: Alice in Wonderland, classics, retelling of the classics, Fantasy, Cleverness, Creativity and imagination, Magic, Manners and conduct, Supernatural. Humor. From the Jacket: The fantastical tale of a young girl chasing her White Rabbit has delighted children since Lewis Carroll wrote it generations ago. Here his wonderland shines anew, viewed through the looking glasses of two incomparable artists. Jon Scieszka’s captivating text celebrates all that is curious— and all that is nonsensical—about the world that holds Alice spellbound, from a deliciously absurd tea party to the spectacle of a kingdom of playing cards. Mary Blair’s vibrant art helped shape the look of Walt Disney’s classic animated film. Collected in a picture book for the first time, her illustrations capture the essence of such memorable characters as the Queen of Hearts and the Mad Hatter with stunning immediacy. Brimming with wit and wonder, this sparkling retelling will enchant readers from the moment Alice falls down the rabbit hole, whether or not they’ve made the journey before. Why I love it: I got it out of the library along with all the other Jon Scieszka books but this one is quite different from the others, which were retellings of fairy tales and fables. His humor is different, too. Rather than the silliness of twisted fairy tales and fables he is relying on Carroll to captivate. Alice in Wonderland is an old classic and such many adults have a familiarity with it but I dare say not so much the young picture book enthusiast. I had heard of it and have a familiarity to it from other venues like movies or other parodies but never quite the clean story as it is told here. I loved reading the classic as represented by a picture book. Almost like classic comic books when I was a child. Yes, I learned about the classics through comic books. I’m sure some of you are familiar with this tool of old. Sitting in the drug store drinking a cherry coke and reading the classic comic books was a great way to spend my paper route money and a little time. Resources: Coloring sheets, reading guides and games : http://www.mrsp.com/Activities.aspx . This site aims to reach a wide audience of teachers, parents and museum professionals to connect Lewis Carroll’s classic Alice’s Adventures in Wonderland, a traveling exhibition, and national educational standards with a variety of individual and group learning activities. http://www.mrsp.com/Activities.aspx Another site for crafts and more activities : http://www.dltk-teach.com/books/alice/index.htm . For tons more interactive searches and games and poetry go here: http://www.ruthannzaroff.com/wonderland/. For planning a theme party go here: http://www.alice-in-wonderland.net/mad-tea-party-ideas.html. 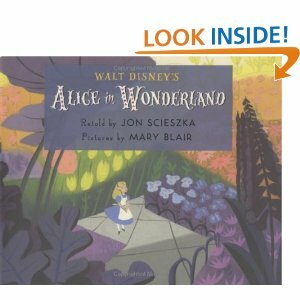 For pre-reading guides and similar topics go here: http://www.scholastic.com/teachers/lesson-plan/alice-wonderland-extension-activities. There were more sites when I googled activities but these should be enough to get you started. As part of Susanna’s blog about Perfect Picture Books Fridays,[hyperlink it here] I help build the list of picture books with resources and recommendations. Everything parents need to know is on the internet these days but they need to be promoted. If you know a librarian, teacher or parent, tell them about this list. They may be glad to know it exists. I see parents and kids leaving the library with hands full of books. How are they picked? By the cover? Title? If a little research went into each book how important it would be. We need to let our libraries know about Susanna and her list. Then the librarians will have an easier time helping parents. I am going to talk to my children’s librarian as soon as I make another trip there. I’ll let you know what happens. OK? For more books with resources please visit Perfect Picture Books at Susanna Leonard Hill’s blog . And if you’d like to be whisked away through cyber space to the resource page and the list of more marvelous recommended perfect picture books just click on the perfect picture book badge on the right. Have you read Jon Scieszka’s book of Alice in Wonderland or another like it? 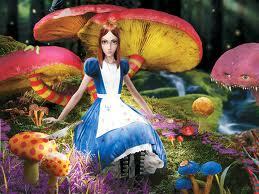 Have you read Lewis Carroll’s Alice or seen the Disney’s movie? Would you like to if you haven’t? This entry was posted in Clara Bowman-Jahn, Clarike Bowman-Jahn, Course or Book Review, social networking, Uncategorized and tagged Alice in Wonderland, Alice's Adventures in Wonderland, Disney Press, Humor, Jon Scieszka, Lewis Carroll, Mary Blair, Perfect Picture Book Friday, Susanna Leonard Hill. Bookmark the permalink. I’ve read Alices Adventures in Wonderland and Through the Looking-Glass, and What Alice Found There and I like them very much! I saw the Disney cartoon but not the other (new) movie . The picture book by Mr. Scieszka looks great – I like the cover illustration! I posted your link on my FB fan page as usual–love your Perfect Picture Book Friday posts! I can tell already that jon’s style is perfect for a re-telling of Alice. I can’t wait to resad this. Jon Scieszka is unique in all the world (and some day I’m going to learn how to spell his name!) I heard him speak at SCBWI LA last year, and was captivated. I must read this book! lol, it took me awhile to spell his name, too. Jon Scieszka is a magical man. . . yet I am reluctant to tamper with my childhood pleasure in the original words. Though if anyone could tempt me it would be him. Need to work up my courage, mates. You’ll be surprised with how untampered Jon left it. This is the most real to the original version I have come across. If you finally read it let me know. You’re on a Jon Scieszka roll — love it. Sounds like agreat retelling of a wonderful classic, in only a manner he can do. Thanks for sharing this lovely book! Oooh, a Jon Scieszka book I haven’t heard of! My family loves the most recent movie of Alice in Wonderland, it really captures the strangeness of Lewis Carroll’s story. Thank you for this recommendation. Hi there Clar, like Heather this is a Scieszka book I have not heard of as well! How nice! Such a treat to visit your site and see your recommendations. It actually reminded me of Suzy Lee’s wordless version of Alice – have you seen that yet? Eerie, disturbing, and an all around great book! I’ve started a folder for the wonderful childrens books you have blogged about so I’ll remember what to buy when our boys start having children (probably still 2-3 years away). This sounds like a lovely version. Thank you. I’m flattered you are doing that, Richard. Just pick up any Jon Schieszka and they will looove it. And don’t forget to check out the blog of Perfect Picture Books on Susanna’s blog. They all come with perfect recommendations. Should you read this soon, please get in touch. I’d like to send April Fool Phyllis out today if you can get back to me! I need your address as I cannot find the email that Susanna sent me and she must be offline. Oh thanks. I guess I haven’t read it in my inbox yet. I’m usually overloaded on email. So thanks for sending me a msg this way, too. Thanks for adding this. I am a HUGE fan of “re-tellings” and a HUGE of Jon Scieszka. The illustrations are amazing! 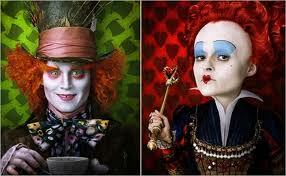 Well actually the photos of the Madhatter and the Queen of Hearts are from the new movie by Disney and not from the book.